We have been building dovetail, post & beam log houses and timber frame homes at our production site in Merritt BC (located In the heart of the Beautiful Nicola Valley) since 1989. We excel in challenging and complex log and timber joinery, but also enjoy constructing simple handcrafted log cabins and modest primary residences. Each of our log homes or timber frame homes is a custom plan reflecting the unique lifestyle requirements, aesthetic tastes, and budget of the customer. All of our handcrafted log homes and timber work is cut and pre-built by the Nicola LogWorks Team; local structures are re-set by the Nicola LogWorks crew, while log homes going overseas or into the US are accompanied by one or two members of the crew who offer technical assistance to our customers local team during the re-set of the log or timber components of the building. 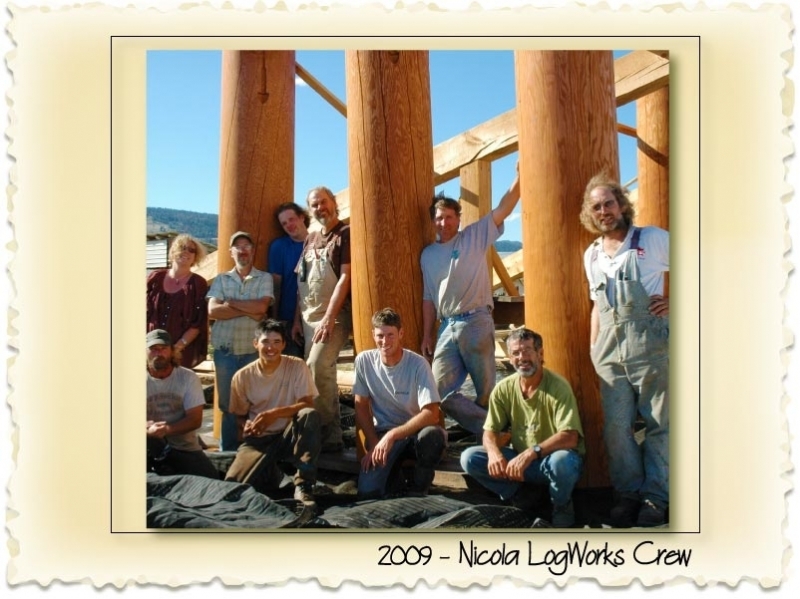 Equally comfortable setting up a log or timber home in the back of beyond or providing heavy timber services for the installation of massive engineered wood in the high pressure environment of commericial construction, the crew at Nicola LogWorks lives up to our reputation as a "multi-discipline log and timber builders". There is a great deal of satisfaction in helping people realize their dreams. Our residential homes are delivered pretty much anywhere in the world - and wherever we go - we find good company! From North Carolina to Kodiak Alaska, from Denmark to Dresden, from Kyoto to Tokyo and all across Canada we have served great customers since 1989. And that's just one of the things we like about our chosen work! Just want to look at the pretty pictures? Got to our Photo Gallery.